James Ensor (1860-1949), pioneer of modern art, is one of the most important Belgian artists. He owes this prominent position not only to his paintings, but also to his graphic works which are part of the best and most original objects modern printing art has produced. Ensor started etching in 1886, at the very peak of his artistic career. Although Ensor declared that he had started etching because of the durability of this medium, it is quite obvious that he was drawn to this technique under the influence of the old masters which he copied around the year 1886. Ensor's writings tell us that he was not very successful in selling his paintings at that time and that he was looking for a means of expression that would yield cheaper and hence easier to sell art works. 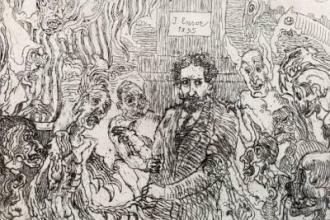 James Ensor considered his etchings to be valuable, independent art works. He was not working as an illustrator or designer for the literary business, like his contemporaries Félicien Rops, Charles Doudelet or George Minne. He displayed his graphic work together with his paintings and drawings at exhibitions such as those organised by the Brussels art society ‘Les Vingt’. Ensor’s graphic oeuvre includes about 130 prints. Over half of this entire production was realised between 1886 and 1891, the artist’s exceptionally creative years. Apart from a few lithographs and vernis mous (soft wax plates), the artist focused on etching and dry-point engravings.